What is a "horse" as it applies to the world of poker? 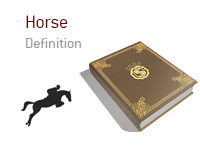 What is meant by the term "horse"? In poker, a "horse" is somebody who is being backed. This means that they are receiving partial or full support (from a monetary standpoint) to play cash games or tournaments. Popular usage of the term - "I had four horses in the World Series of Poker main event. One of them took second place, and I ended up clearing almost $4 million." This means that this person was staking four players in the World Series of Poker. In this situation, the backer likely paid for all four of the player's full buy-ins in return for a percentage of the profits. Staking of "horses" is very prevalent in the world of poker. Many players simply don't have the bankrolls to play at the levels that they want, while other players are simply looking to minimize their risk (even a very good player with a sizeable bankroll can go broke on the poker tournament circuit pretty quickly, especially after considering travel expenses, etc). Staking of "horses" can be a very profitable activity. It's obviously of the utmost importance to select honest and talented players - many stakers have been ripped off by "horses" that have failed to honor the terms of their agreements.